I first learned about Alex Odeh when a group of people with “JDL” signs heckled an event I organized as a student at Cal State Fullerton back in 2005, which featured Norman Finkelstein as the speaker. He was interrupted several times by the widow of JDL terrorist Irv Rubin (read this Daily Titan article on the event). 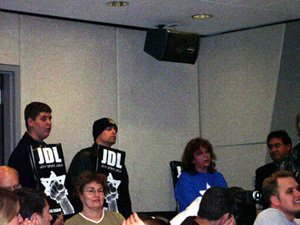 An FBI spokesman identified the JDL as the possible responsible group for the assassination of Alex Odeh. 30 years later the case remains unsolved with federal authorities unable to make arrests. Read Gabriel San Roman’s article in the OC Weekly here.